For many years, cavities were filled with Dental amalgam, a mixture of metals, including tin, silver and mercury. It was considered perfectly normal to see these dark grey areas in someone's mouth when they talked or laughed. 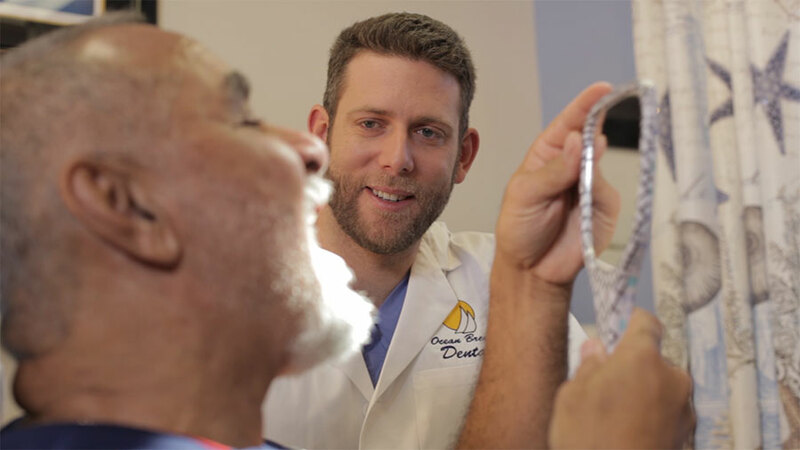 At Ocean Breeze Dental we have chosen to eliminate dental amalgam and mercury from our practice, as we feel it is in our patients' best interests. At Ocean Breeze Dental, you can have your cavities, or small chips in your front teeth filled with tooth colored composite fillings. Composite fillings are made from resins and come in numerous shades that can be customized to your individual teeth so that they are practically invisible when applied. Unlike Dental amalgam, composite fillings actually bond to your tooth structure through the use of adhesives and bonding agents. This mechanical as well as chemical bond provides an excellent seal on the affected area, so that future tooth decay can be prevented. Although composite resins are cosmetically pleasing and easily placed, their durability is not as strong as other types of definitive restorations that we offer. These resins typically last from 3-7 years before they begin to chip and wear away. When this happens, the restoration will need to be replaced. For larger and severe cavities crowns or veneers are often a better and more durable solution. Will you numb me before you drill on my teeth? Anytime we drill on your teeth we will usually numb you so you are comfortable during the procedure. In some instances if you just have a small filling you may not require anesthesia, but it is always your choice. Certain patients do not like getting numb and we try to honor your request in such cases. I brush every day, how did I get a cavity? Cavities can form between the teeth where your tooth brush cannot reach or on root surfaces which are more susceptible to cavities. Also many people have natural pits, fissures, and other defects which are difficult to clean and more prone to developing a cavity. Unfortunately sometimes due to the amount of decay, missing tooth structure, or the presence of an active infection inside the tooth, it is not possible to just fill the tooth. Please understand that when the doctor tells you your tooth needs a root canal or crown they have your best interests in mind. We also can not just place a filling on a tooth with an active infection or abscess as that would be negligence and a disservice to you the patient. Do you use the silver/mercury filling material? We are a mercury free office at Ocean Breeze Dental and do not place silver fillings.